Horizon: Zero Dawn, from Guerilla Studios. Holy hell that game looks amazing. Futuristic Turok the robot dinosaur hunter? Sign me up. It looks gorgeous, and given that I was never really a Killzone fan I’m excited to see where this leads. Hitman – Meh. Honestly, not groundbreaking. Street Fighter V – This is big for fighting people, but not me. Glad to see Sony will have some exclusivity on this, as it ties them into the fighting scene more than they were previously. With the MadCatz PS4 fight sticks selling like hotcakes, I’m sure this new title will do just fine in the competitive arena. Dreams – This game is creepy. And lonely. And scary. And weird and lovely, and I’d like to play it. Media Molecule has always been about the “creation” of everything, and Dreams definitely shows promise in that regards. Very excited to see where dreams can go, and I think that’s probably what Mm is thinking too. Firewatch – This game looks really cool too. Seems like it’s a bit of an exploration-mystery game. Worth checking out. Theres some gameplay videos on youtube but the trailer is below. We can’t ignore how HUGE Shenmue III’s announcment was, nor Final Fantasy VII. Shenmue III is on KickStarter (which already hit it’s $2 million goal by the way), and having that at Sony’s stage was fantastic. Final Fantasy VII? I won’t even talk. Just watch. Ignoring the fact that the demo had to reset because Nathan’s character got stuck at the loading screen, it’s looking to be an impressive game. Sully is back and the combat looks to be improved as well. A little more attention to the fighting mechanics from what I saw in the trailer, probably taken from the success of the mechanics in The Last of Us, given that stealth and hand to hand combat was more prevalent in that game than gunplay was. The minimized UI for weapon pick-ups and combat moves looked great too. Overall I think they showed a ton of gameplay and I’m super excited to play it. 2016 cannot come soon enough. Check the trailer below. 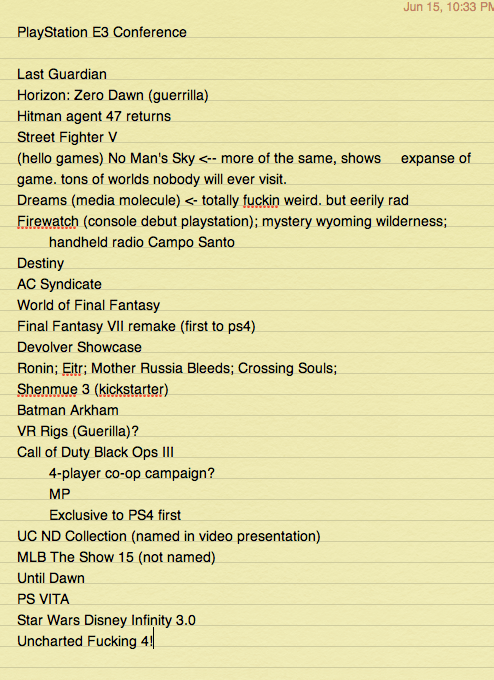 This Sony E3 Press Conference round up was a bit out of sorts and not really cohesive, but I’m just trying to get my thoughts out about these games. I’m excited for a lot of things to be announced, and while the PS Vita isn’t a dead console, it’s a bummer it was basically glossed over during the conference. I know that basically all of Sony’s first party studios are working on PS4 titles, but hopefully 3rd party support for Vita continues to be great. Overall, I think Sony definitely nailed it with Uncharted 4, The Last Guardian, and Shenmue III. Final Fantasy VII is icing on the cake. What say you? What was your favorite part about the Sony E3 Press Conference? Let us know in the comments or tweet us! Ep 26 – Post-E3 Discussions; Conference Wins and more!